It’s estimated that honeybees must fly 150,000 miles to produce one pound of wax. That’s pretty spectacular. RESPECT. 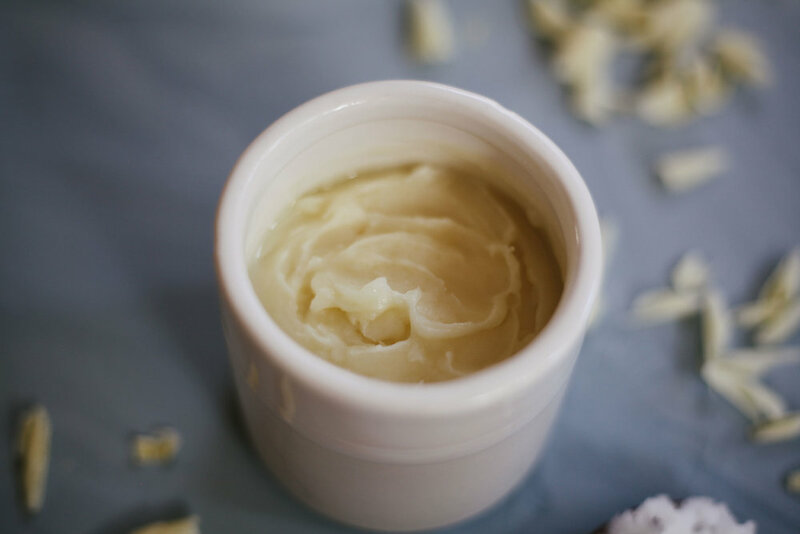 Here’s a recipe for a super simple, very nourishing, ultra-moisturizing face cream that only involves two, count it, TWO ingredients: beeswax and coconut oil. Thank you to all our bee friends who make such wholesome luxuries possible. Beeswax and coconut oil are an incredible duo that is truly awesome for the skin. They have antibacterial & antifungal properties, so you could also use this recipe as an organic diaper cream or general skin treatment salve, suitable for babies and sensitive skin irritations alike. It also helps fight acne and wrinkles and is a general skin soother. My fiancée likes to use it as hair oil and I often put it on bug bites and use it as chapstick. It’s fantastically all-purpose! I will say that it can take a couple minutes to completely absorb into your skin. My especially thirsty and sometimes chapped fall and winter skin love this. It’s especially soothing while reducing irritation and itchiness due to eczema and many forms of dermatitis. In a nutshell, all you have to do is melt the two ingredients together in a double boiler, pour it into your chosen containers, and let it cool undisturbed. To make this DIY face cream, I start by filling a sauce pot about 1/4 of the way with water and float a metal or glass bowl on top. You want the bowl to be large enough so that it won’t tip over in the pot. You’re doing just fine if the water touches the bottom of the bowl, and/or the bowl presses against the sides of the pot. Please use organic and unrefined wax and oil whenever possible. This is especially important for the beeswax as it acts like a sponge, soaking up and storing chemicals in the hive. Bring the water to a gentle simmer, add beeswax to the bowl and turn the heat off. Use a rubber spatula to swirl and flip the beeswax. Add a little more heat if necessary to melt the wax. Once it’s almost completely melted, mix in your coconut oil. This is the point where you can add in other ingredients like shea butter, jojoba or almond oil, grapefruit seed extract, Vitamin E and a couple drops of your favorite essential oil, but I like mine plain and simple. Once it’s all completely melted, pour into glass containers (wide enough to get your fingers into) and let cool. (CRAFTING TIP: To make this all-over face and body cream an extra special homemade holiday gift, try using lidded antique jars. Check your local Goodwill, yard sales or thrift store.) Then you’re done! it will harden. If it’s solid, don’ worry- it will quickly soften from the heat of your finger tips, making it the perfect consistency for massaging into your face and body. You’ll get a firm yet creamy texture from this recipe. If you want it even firmer add a pinch more beeswax; If you want it softer add less beeswax, or conversely, more coconut oil. Keep in mind that with beeswax, a teeny bit goes a long way. I’ve been pretty much exclusively using this simple DIY moisturizer every single day for the past couple of years, and I love everything about it- its subtly sweet smell, creamy texture, all-around usefulness and utter simplicity. I hope you love it too!